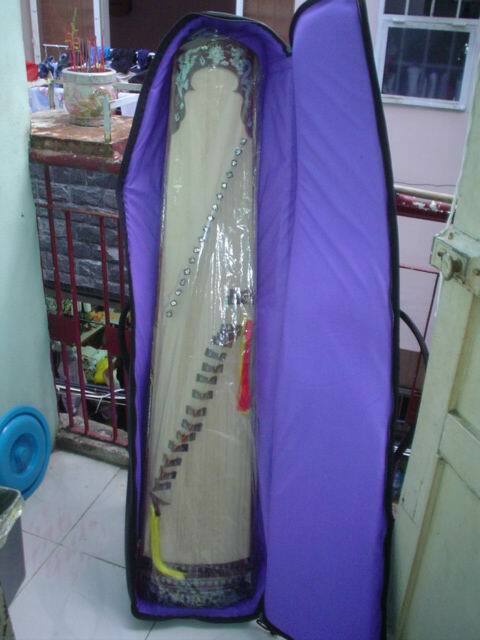 The Dan Tranh is also known as Dan Thap Luc or sixteen-stringed zither. Its shape resembles a bamboo tube that has been sliced vertically in half. The Dan Tranh has mostly been seen performed by female musicians in Vietnamese traditional dress (Ao Dai). When played, the instrument is placed in front of the musician, who uses her right hand to regulate the pitch and vibrate, while plucking the strings with her left hand. The 16-string zither has a rectangular sounding box, about 110 centimetres long that tapers about 13 cm toward an end, with a warped sound board made of unvarnished light wood. The sides are made of hard wood decorated with various designs, either lacquered or inlaid with mother-of-pearl. The bottom is made of light wood with sound holes. The broader end of the sound box is pierced with 16 holes and reinforced with a metal band. The Dan Tranh originates from the ancient capital city of Hue, where women once played it for royalty, and the instrument is still considered a symbol of the city. The dan tranh is normally played unaccompanied, but it can also be used to accompany a singer or as part of an orchestra. Please feel free to inquire about various quality and levels of Dan Tranh's we have, from student, mid-level, professional, concert grade.